We have quite the busy week this week. Tim bought a new Nissan Quest (minivan) to help with transporting Casey. We have been trying to take her for rides to get her used to it. So far she seems much happier in it than she ever was in the Xterra. I was sad to see the Xterra go. That was the longest I ever had a car. Last week, not even a week after we bought the new car, vandals broke into the garage and really did a number on all the cars (15-20 total). They slashed pretty much all of the tires (included all 4 of ours). They keyed may cars, they sprayed the cars with the fire extinguisher, and they pounded on some cars. Luckily we only had a small scratch and4 flat tires, and the fire spray that washed off. Some cars were really bad. The tires have been replaced. We are glad to have it back, but so disgusted with the entire situation. Casey’s PT went on maternity leave last week so she started up with her temp PT today. Her normal PT will be back in 6 months. The new PT seems like she will be pretty good. She didn’t work with Casey yet, she just spent some time getting to know her and her history this morning. Tomorrow Casey has an MRI in Beverly Hills. They had to sedate her, which means she will have to get an IV. She hates IV’s, and I don’t blame her. With her tight muscles, and little veins they always have such a hard time starting a line. Hopefully they can do it in less than 3 sticks this time. It just breaks my heart to watch her get poked so much. 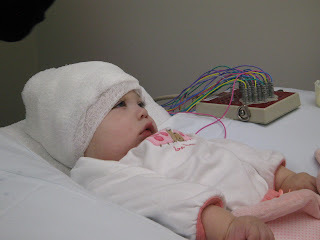 She had a follow up EEG last week (pictured above), and we will meet with her neuro next week to discuss the results of both. On Wednesday she sees her pediatrician in the morning to get her RSV shot. Then we head to UCLA for her GI clinic. She is getting so close to 15 pounds. I am sure GI is going to be so excited for her. On Thursday Tim and I are taking her to Children’s where a group of Ortho’s will be reviewing her case. We hope to get some good ideas for a progressive plan moving forward. Then on Friday she has her first working session with her new PT. Some of the things we talked about this morning will be sure that she continues with all the work the previous PT was doing. However, she has some new ideas to try out as well. We don’t have it scheduled yet, but most likely it will also be on Friday, Casey will have an OT visit. We are hoping to get these moved up to weekly rather than bimonthly. Her new PT mentioned trying to get some vision therapy started as well. I didn’t even know there was such a thing, but anything that could possibly help sounds good to me. She also suggested acupuncture (which oddly enough just last week Casey’s respit nurse also mentioned). There is a technique that one of the specialist Casey sees for orthotics has done called Cranial Sacral Therapy. Casey responded really well to this, so when the new PT brought it up I agreed that it sounds like a good idea. So maybe we can get some of these new therapies started up in the next few weeks. Now that Casey is going to GI once a month instead of week, she has a lot more flex in her schedule. I will try and post next week after things have calmed down some. Until then, we hope everyone is doing well.